Coping with an Age Gap! There is an almost 5 year age gap between James and Evelyn with James being the oldest at 6 and a half and Evelyn almost 2. I didn't plan to have such an age gap in fact I didn't really plan at all. I fell pregnant with James when I was just 18 and whilst unexpected I now wouldn't change him for the world! Being so young made me realise I didn't want to rush in to having more kids just because of an age gap. I wanted to wait until I was ready, until I felt ready to make that big leap in to becoming a mum of 2. 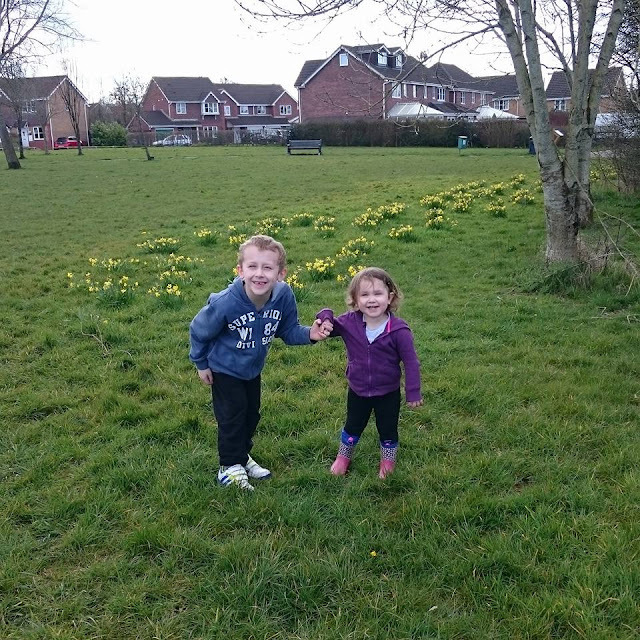 It took us quite a while to conceive Evelyn when we finally decided we were ready, which also widened the gap between them and when she eventually came along it was the summer before James was due to start Primary school. 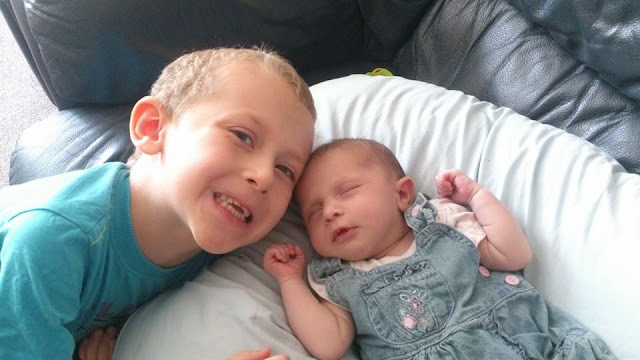 Of course with James being a little older it was nice that he could understand a little more about the fact he was going to become a big brother and he was so excited to meet his new baby sister. I worried the whole time I was pregnant though about him feeling pushed out, it had been just him for so long how would he feel about sharing me. When Evelyn came along James was amazing with her, he couldn't wait to meet her and was so gentle and protective over her whenever he was around. You could just tell how proud he was at being a big brother which did make me feel much better about the situation. We also always made sure we made some time that he have one on one time with just us when Evelyn was in bed so he knew he still had our attention too which definitely helped. I am not going to lie though having the age gap is tough especially now at this sort of age. Evelyn is at an age where she wants to be involved in everything everyone else is doing, mostly her brother! Whereas James wants a bit of Independence he is much older and doesn't want to play the baby games that Evelyn is able to do. As a parent its trying to waiver on that thin line between encouraging them to play together and letting them have their own time and space. 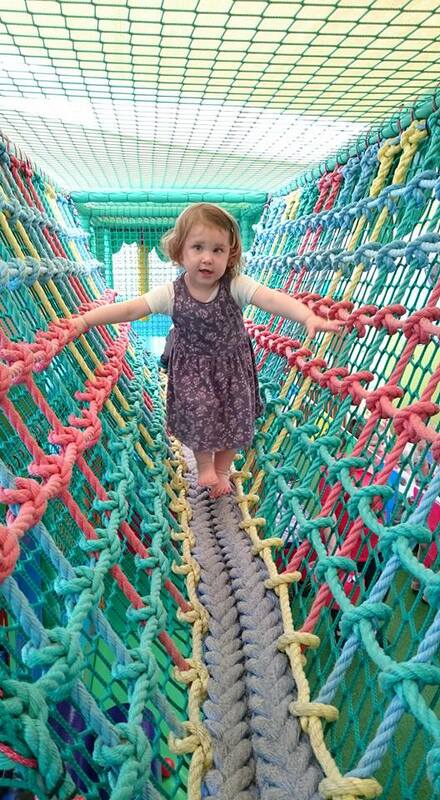 For example we went to a soft play a few days ago, this posed another problem. The soft play centres James likes are huge, high and pretty dangerous for Evelyn, of course they have baby sections but Evelyn doesn't want to be in those if James isn't. However the soft play's that are suitable for Evelyn are much to babyish for James who then bores easily in them. Such a simple thing such as soft play becomes a nightmare of feeling like someone if missing out, its toughie but we have managed to find a few places that meet in the middle and keep them both happy. James is also at school now and with school comes after school clubs including swimming clubs and Beaver scouts. I do feel for Evelyn a little and she often gets carted along to these as her dad is at work and I have to take James. As there is such an age gap none of these clubs are suitable for Evelyn which means she is often bored and spends more time than I would like her to in the pushchair whilst we watch or wait around for James. Of course there are perks to the age gap too. As James is older is easier to explain to him about why we have to do things. He helps play with Evelyn so I can do the washing up and watching him be so protective over her is so beautiful. 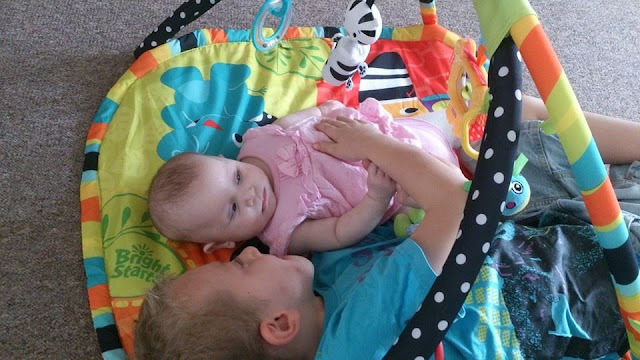 Evelyn dotes on her big brother which is so wonderful and I think this is partly because hes that bit older than her and she looks up to him. I have found there doesn't seem to be as much arguing between them either. Perhaps because the toys Evelyn has James doesn't want and the toys James has Evelyn doesn't know how to use! I am certain the arguing with come later though and of course they do still argue usually over food or bed time! People ask would I change the age gap and my simply answer is no! Yes its hard, really hard sometimes actually but I definitely didn't feel ready for another when James was younger and I am glad I didn't push myself to have another just for a small age gap. I think for me I feel it would have been even harder with 2 when I wasn't mentally prepared for another child than it is with a bigger age gap. Whilst there are tough days there are amazing days too though! James is adorable with his sister when they are getting on and watching him teach her and her intently listening fills me with pride. Knowing that she has a brother that little bit older to guide her through the world with that little bit of extra knowledge behind him makes me love them both a little more. When people ask the question "whats the best age gap?" my answer is there is no "perfect" age gap. With any age gap will come hard days and situations as well as positives. You just have to do what feels right for you and your family. I have a 4 year age gap between Roo and Tigger, then a 5 year age gap between Tigger and Piglet. Personally I feel that there are benefits to having an age gap, although it does sometimes feel like you are starting again.